This collection of wires that I keep referring to between the tank and the monitoring location can be called a bus or a network. The distinction between these two terms is more semantic than technical, and the two may be used interchangeably for all practical purposes. In my experience, the term "bus" is usually used in reference to a set of wires connecting digital components within the enclosure of a computer device, and "network" is for something that is physically more widespread. In recent years, however, the word "bus" has gained popularity in describing networks that specialize in interconnecting discrete instrumentation sensors over long distances ("Fieldbus" and "Profibus" are two examples). In either case, we are making reference to the means by which two or more digital devices are connected together so that data can be communicated between them. Names like "Fieldbus" or "Profibus" encompass not only the physical wiring of the bus or network, but also the specified voltage levels for communication, their timing sequences (especially for serial data transmission), connector pinout specifications, and all other distinguishing technical features of the network. In other words, when we speak of a certain type of bus or network by name, we're actually speaking of a communications standard, roughly analogous to the rules and vocabulary of a written language. For example, before two or more people can become pen-pals, they must be able to write to one another in a common format. To merely have a mail system that is able to deliver their letters to each other is not enough. If they agree to write to each other in French, they agree to hold to the conventions of character set, vocabulary, spelling, and grammar that is specified by the standard of the French language. Likewise, if we connect two Profibus devices together, they will be able to communicate with each other only because the Profibus standard has specified such important details as voltage levels, timing sequences, etc. Simply having a set of wires strung between multiple devices is not enough to construct a working system (especially if the devices were built by different manufacturers!). The physical wiring for the BogusBus consists of seven wires between the transmitter device (switches) and the receiver device (lamps). The transmitter consists of all components and wiring connections to the left of the leftmost connectors (the "-->>--" symbols). Each connector symbol represents a complementary male and female element. The bus wiring consists of the seven wires between the connector pairs. Finally, the receiver and all of its constituent wiring lies to the right of the rightmost connectors. Five of the network wires (labeled 1 through 5) carry the data while two of those wires (labeled +V and -V) provide connections for DC power supplies. There is a standard for the 7-pin connector plugs, as well. The pin layout is asymmetrical to prevent "backward" connection. In order for manufacturers to receive the awe-inspiring "BogusBus-compliant" certification on their products, they would have to comply with the specifications set by the designers of BogusBus (most likely another company, which designed the bus for a specific task and ended up marketing it for a wide variety of purposes). 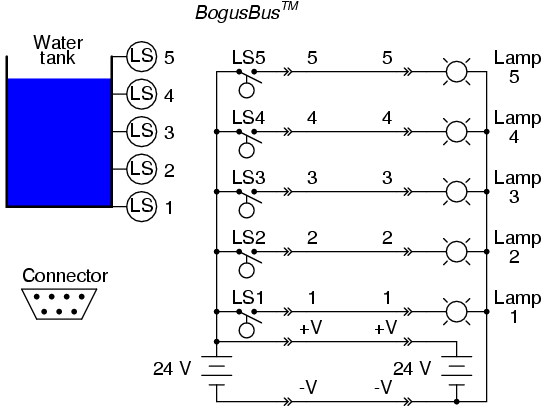 For instance, all devices must be able to use the 24 Volt DC supply power of BogusBus: the switch contacts in the transmitter must be rated for switching that DC voltage, the lamps must definitely be rated for being powered by that voltage, and the connectors must be able to handle it all. Wiring, of course, must be in compliance with that same standard: lamps 1 through 5, for example, must be wired to the appropriate pins so that when LS4 of Manufacturer XYZ's transmitter closes, lamp 4 of Manufacturer ABC's receiver lights up, and so on. Since both transmitter and receiver contain DC power supplies rated at an output of 24 Volts, all transmitter/receiver combinations (from all certified manufacturers) must have power supplies that can be safely wired in parallel. Consider what could happen if Manufacturer XYZ made a transmitter with the negative (-) side of their 24VDC power supply attached to earth ground and Manufacturer ABC made a receiver with the positive (+) side of their 24VDC power supply attached to earth ground. If both earth grounds are relatively "solid" (that is, a low resistance between them, such as might be the case if the two grounds were made on the metal structure of an industrial building), the two power supplies would short-circuit each other! BogusBus, of course, is a completely hypothetical and very impractical example of a digital network. It has incredibly poor data resolution, requires substantial wiring to connect devices, and communicates in only a single direction (from transmitter to receiver). It does, however, suffice as a tutorial example of what a network is and some of the considerations associated with network selection and operation. PC/AT Bus used in early IBM-compatible computers to connect peripheral devices such as disk drive and sound cards to the motherboard of the computer. PCI Another bus used in personal computers, but not limited to IBM-compatibles. Much faster than PC/AT. Typical data transfer rate of 100 Mbytes/second (32 bit) and 200 Mbytes/second (64 bit). PCMCIA A bus designed to connect peripherals to laptop and notebook sized personal computers. Has a very small physical "footprint," but is considerably slower than other popular PC buses. VME A high-performance bus (co-designed by Motorola, and based on Motorola's earlier Versa-Bus standard) for constructing versatile industrial and military computers, where multiple memory, peripheral, and even microprocessor cards could be plugged in to a passive "rack" or "card cage" to facilitate custom system designs. Typical data transfer rate of 50 Mbytes/second (64 bits wide). VXI Actually an expansion of the VME bus, VXI (VME eXtension for Instrumentation) includes the standard VME bus along with connectors for analog signals between cards in the rack. S-100 Sometimes called the Altair bus, this bus standard was the product of a conference in 1976, intended to serve as an interface to the Intel 8080 microprocessor chip. Similar in philosophy to the VME, where multiple function cards could be plugged in to a passive "rack," facilitating the construction of custom systems. MC6800 The Motorola equivalent of the Intel-centric S-100 bus, designed to interface peripheral devices to the popular Motorola 6800 microprocessor chip. STD Stands for Simple-To-Design, and is yet another passive "rack" similar to the PC/AT bus, and lends itself well toward designs based on IBM-compatible hardware. Designed by Pro-Log, it is 8 bits wide (parallel), accommodating relatively small (4.5 inch by 6.5 inch) circuit cards. Multibus I and II Another bus intended for the flexible design of custom computer systems, designed by Intel. 16 bits wide (parallel). CompactPCI An industrial adaptation of the personal computer PCI standard, designed as a higher-performance alternative to the older VME bus. At a bus clock speed of 66 MHz, data transfer rates are 200 Mbytes/ second (32 bit) or 400 Mbytes/sec (64 bit). Microchannel Yet another bus, this one designed by IBM for their ill-fated PS/2 series of computers, intended for the interfacing of PC motherboards to peripheral devices. IDE A bus used primarily for connecting personal computer hard disk drives with the appropriate peripheral cards. Widely used in today's personal computers for hard drive and CD-ROM drive interfacing. SCSI An alternative (technically superior to IDE) bus used for personal computer disk drives. SCSI stands for Small Computer System Interface. Used in some IBM-compatible PC's, as well as Macintosh (Apple), and many mini and mainframe business computers. Used to interface hard drives, CD-ROM drives, floppy disk drives, printers, scanners, modems, and a host of other peripheral devices. Speeds up to 1.5 Mbytes per second for the original standard. GPIB (IEEE 488) General Purpose Interface Bus, also known as HPIB or IEEE 488, which was intended for the interfacing of electronic test equipment such as oscilloscopes and multimeters to personal computers. 8 bit wide address/data "path" with 8 additional lines for communications control. Centronics parallel Widely used on personal computers for interfacing printer and plotter devices. Sometimes used to interface with other peripheral devices, such as external ZIP (100 Mbyte floppy) disk drives and tape drives. USB Universal Serial Bus, which is intended to interconnect many external peripheral devices (such as keyboards, modems, mice, etc.) to personal computers. Long used on Macintosh PC's, it is now being installed as new equipment on IBM-compatible machines. FireWire (IEEE 1394) A high-speed serial network capable of operating at 100, 200, or 400 Mbps with versatile features such as "hot swapping" (adding or removing devices with the power on) and flexible topology. Designed for high-performance personal computer interfacing. Bluetooth A radio-based communications network designed for office linking of computer devices. Provisions for data security designed into this network standard. 20 mA current loop Not to be confused with the common instrumentation 4-20 mA analog standard, this is a digital communications network based on interrupting a 20 mA (or sometimes 60 mA) current loop to represent binary data. Although the low impedance gives good noise immunity, it is susceptible to wiring faults (such as breaks) which would fail the entire network. RS-232C The most common serial network used in computer systems, often used to link peripheral devices such as printers and mice to a personal computer. Limited in speed and distance (typically 45 feet and 20 kbps, although higher speeds can be run with shorter distances). I've been able to run RS-232 reliably at speeds in excess of 100 kbps, but this was using a cable only 6 feet long! RS-232C is often referred to simply as RS-232 (no "C"). RS-422A/RS-485 Two serial networks designed to overcome some of the distance and versatility limitations of RS-232C. Used widely in industry to link serial devices together in electrically "noisy" plant environments. Much greater distance and speed limitations than RS-232C, typically over half a mile and at speeds approaching 10 Mbps. Ethernet (IEEE 802.3) A high-speed network which links computers and some types of peripheral devices together. "Normal" Ethernet runs at a speed of 10 million bits/second, and "Fast" Ethernet runs at 100 million bits/second. The slower (10 Mbps) Ethernet has been implemented in a variety of means on copper wire (thick coax = "10BASE5", thin coax = "10BASE2", twisted-pair = "10BASE-T"), radio, and on optical fiber ("10BASE-F"). The Fast Ethernet has also been implemented on a few different means (twisted-pair, 2 pair = 100BASE-TX; twisted-pair, 4 pair = 100BASE-T4; optical fiber = 100BASE-FX). Token ring Another high-speed network linking computer devices together, using a philosophy of communication that is much different from Ethernet, allowing for more precise response times from individual network devices, and greater immunity to network wiring damage. FDDI A very high-speed network exclusively implemented on fiber-optic cabling. Modbus/Modbus Plus Originally implemented by the Modicon corporation, a large maker of Programmable Logic Controllers (PLCs) for linking remote I/O (Input/Output) racks with a PLC processor. Still quite popular. Profibus Originally implemented by the Siemens corporation, another large maker of PLC equipment. Foundation Fieldbus A high-performance bus expressly designed to allow multiple process instruments (transmitters, controllers, valve positioners) to communicate with host computers and with each other. May ultimately displace the 4-20 mA analog signal as the standard means of interconnecting process control instrumentation in the future.